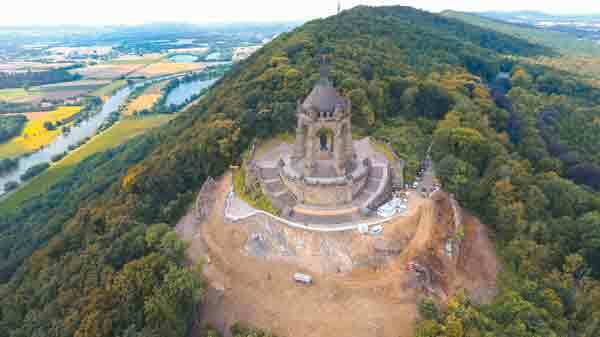 Atop the Wittekindsberg mountain in Germany, at a height of about 210 meters (690 ft) stands the Emperor William I Monument, celebrating the life of Kaiser Wilhelm, built between 1892 and 1896. The 121 year old monument is one of the region’s most prominent landmarks and a popular tourist destination, offering expansive views of the surrounding hills, as well as the Porta Westphalia and southern part of the German Plain. Following the collapse of a portion of the memorial plaza, plans were set in motion to construct a new panorama café and a visitor’s centre on a newly renovated ring terrace. Taking on the project is Kögel Bau, a construction company tasked with civil engineering and construction work. Projected to be completed next year, the project is well underway, but not before a considerable amount of modification to the vicinity was required. Before the construction of the café and visitor centre could begin, Kögel Bau had to design the foundation and ground cables. This included drilling 270 reinforced concrete piles – with a diameter of 200 mm – 32 meters (105 ft) into the mountain. “Creating this substructure was the most difficult aspect of the project,” Kögel recalls. 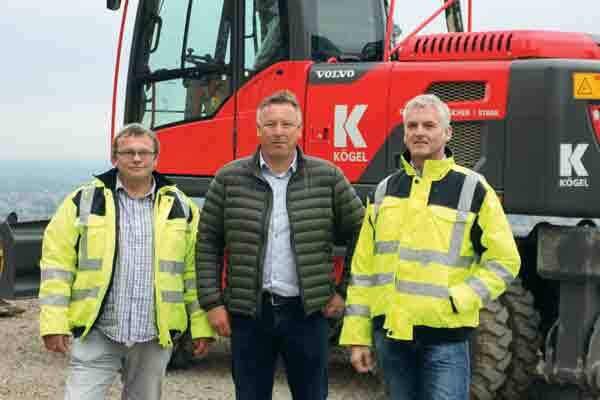 As co-manager of the family-owned company, Kögel knows a thing or two about large-scale construction projects – and selecting the proper equipment. For over 15 years, the company has relied on Volvo CE machines across a variety of projects. “They are reliable and offer good value for money – from the purchase price and service to maintenance costs and the resale value,” he adds. 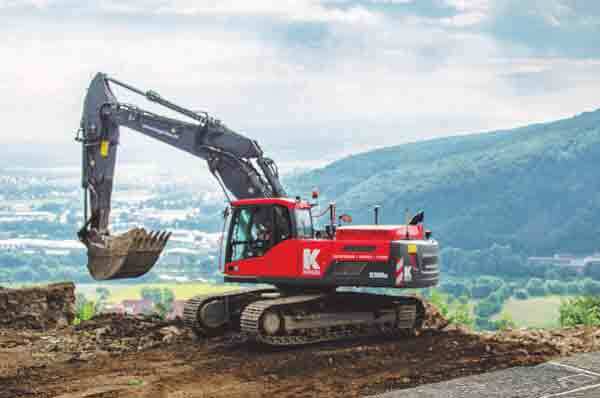 In 2016, Kögel Bau took delivery of a fleet of seven Volvo machines and began working on the monumental work that summer. The equipment line-up includes five L30G compact wheel loaders, an ECR145E short radius excavator and an EW210D wheeled excavator. logistics manager at Kögel Bau. The L30G compact wheel loaders are specified with dual hydraulics that enables simultaneous lifting and steering, helping increase manoeuvrability in tight areas of the jobsite. To aid flexibility, the excavators are equipped with tilt-rotators. Meanwhile, the EW210D features a wide track, heavy counterweight and quick coupler for a simple attachment replacement. The decision has proven a success. 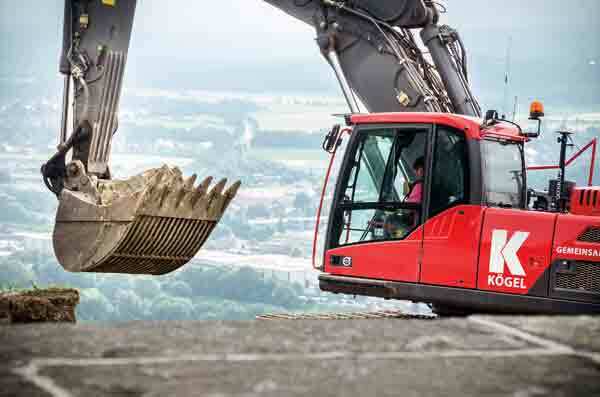 “In just four months, the men have loosened and transported 30,000 cubic meters (40,000 yd2) of earth and rock using GPS-controlled excavators,” explains Peter Kögel. “We’ve also cleared and secured the remains of the old ring terrace that collapsed around 70 years ago.” Additionally, the machines have been used to haul 1,200 square meters (1,435 yd2) of asphalt and construct a 340 meter long (1,115 ft) supply road from the monument to a nearby parking lot. The combination is a recipe for a successful completion of the monument. “We consider ourselves to be an innovative company and expect the same from the technology we use,” says Kögel. “That’s why we fit perfectly with Volvo CE products.